• The 24-hours instrument of boso has been privileged by the European Space Agency (ESA), who uses the device aboard the International Space Station (ISS) for several projects. • A survey of GfK among surgeries in Germany showed, that boso-instruments are the best known and most often used. 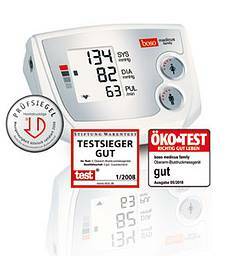 75% of all doctors in Germany use blood pressure instruments of BOSCH + SOHN. boso-medicus prestige, boso-medicus control, boso medicus family, boso-medicus uno, boso-medicus smart and boso-medilife S.
• All blood pressure instruments of boso comply with the regulations of EN1060. The German Foundation for comparative product testing ("Stiftung Warentest") tested blood pressure instruments (see issue 01/2008 of "Test-Heft" Stiftung Warentest). Among 10 wrist blood pressure instruments the "boso-medistar S" got the best score. Likewise the "boso-medicus familiy" achieved the best result among the tested upper arm instruments. This result is just another proof for the excellent quality and accuracy of the BOSCH + SOHN blood pressure instruments. In the test first of all the measurement-precision was evaluated – but also the user friendliness and the overall quality of the instruments were assessed. The result: both boso-instruments tested were awarded the best grades among all other brands. BOSCH + SOHN - premium quality for your health.